"Our own honour, Voadicea, or Boodicea; By some Bunduica, and Bunduca: Queen of the Iceni." Boudicca is the form given by Tacitus (Agricola, XVI; Annals, XIV.31) and the only contemporary rendering of the name. In the Loeb edition of Cassius Dio, the name is transliterated as "Buduica" (LXII.2). Gildas may refer to the queen in the sixth century AD when he mentions "the treacherous lioness" who killed the rulers left behind by Rome when they abandoned the country (De Excidio Britanniae, I.6). The queen was introduced to English readers in 1534 by Polydore Vergil, who gives the name as "Boadicia" (Anglica Historia, II.5-6). The variant "Boadicea" originally occurred as a misprint in 1624 (the author admitting that "Her name in antiquitie is very variouslie written") and first used intentionally in 1658 by Thomas Browne in Hydriotaphia (II). Boadicea also was the title of an eponymous English tragedy in 1697, one of several phonetic spellings adapted by seventeenth-century playwrights, including Ben Jonson and John Fletcher. 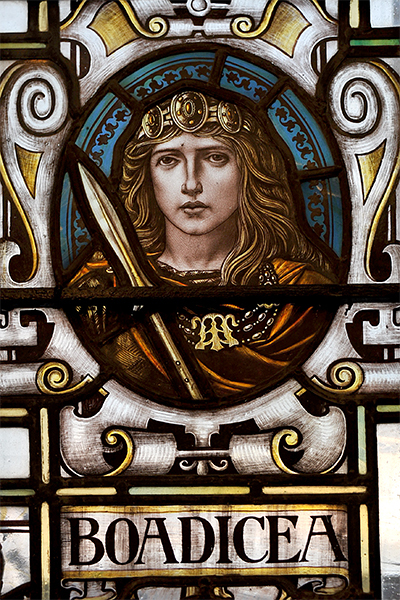 Although there is a certain euphony to "Boadicea," the name of the Iceni queen probably should be "Boudica" or possibly "Boudicca" after Tacitus, a variation of "victory" in Celtic and the equivalent of the modern "Victoria." This stained glass portrait of the queen is in the Colchester Town Hall, which is on the site of the original Roman forum. "Boadicea" also identifies the monumental bronze statue of Boudica and her daughters on the embankment of the Thames, which dates from about the same time (1902). Reference: Boudica and Her Stories: Narrative Transformations of a Warrior Queen (2009) by Carolyn D. Williams.